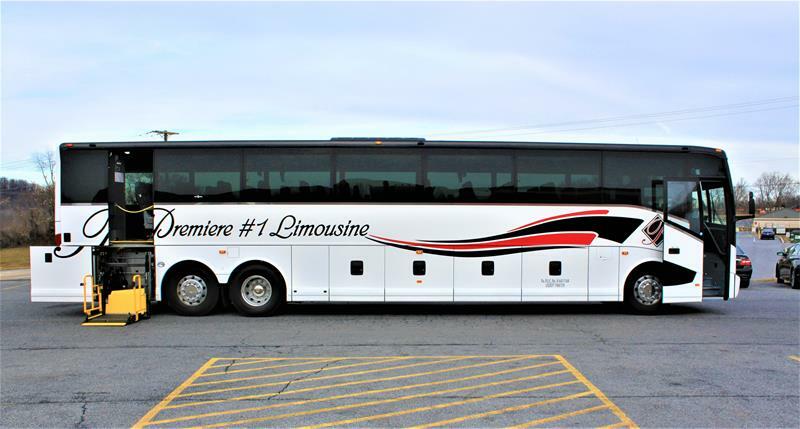 Middletown, PA – Premiere #1 Limousine Service adds its first handicap-accessible, 56-passenger motorcoach to its fleet. The motorcoach is a 2016 Van Hool CX45. Equipped with a wheelchair lift, the bus can accommodate two wheelchairs at one time. The Van Hool was purchased from ABC Companies in Camden, New Jersey. This is the third 56-passenger motorcoach to be added to Premiere’s fleet, joining the two previously purchased Volvo 9700 models. All three motorcoaches were added to the fleet within an 18-month span. Passengers of the new handicap-accessible motorcoach will still receive chauffeur-driven services, as do all other vehicles in the fleet. Premiere #1 Limousine Service has provided luxury transportation services in Central PA for 15 years. In March 2009, a new owner acquired the business and has since expanded the fleet to include S and E class Mercedes, SUVs, passenger vans, corporate limousines, minibuses and luxury motorcoaches. With a combined total of 30+ years in the transportation industry, the principals have a highly capable and experienced management team in place. Our discerning, upscale clients demand safety, quality, and exceptional value, which we consistently deliver. For more information, go to Premiere1Limousine.com, or call (717) 616-8995.